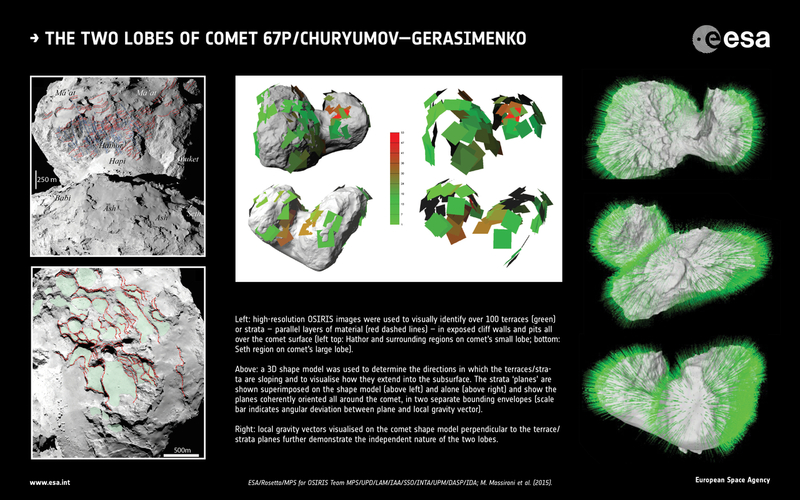 The methods used by Rosetta scientists to determine that comet 67P/Churyumov-Gerasimenko's shape arises from two separately forming comets. Left: high-resolution OSIRIS images were used to visually identify over 100 terraces (green) or strata - parallel layers of material (red dashed lines) - in exposed cliff walls and pits all over the comet surface (top: Hathor and surrounding regions on comet's small lobe; bottom: Seth region on comet's large lobe). Middle: a 3D shape model was used to determine the directions in which the terraces/strata are sloping and to visualise how they extend into the subsurface. The strata 'planes' are shown superimposed on the shape model (left panel) and alone (right panel) and show the planes coherently oriented all around the comet, in two separate bounding envelopes (scale bar indicates angular deviation between plane and local gravity vector). Right: local gravity vectors visualised on the comet shape model perpendicular to the terrace/strata planes further realise the independent nature of the two lobes.